Is Sclerotherapy available at all Skin Renewal Branches? Sclerotherapy treatment is availablein Johannesburg, Sandton and Pretoria at the Morningside, Parkhurst, Bedfordview, Fourways, West Rand, Illovo, Irene, Brooklyn as well as in the Western Cape at Cape Quarter, Claremont, Constantia, Stellenbosch, Paarl and Willowbridge branches and KwaZulu Natal in Durban and Umhlanga. Sclerotherapy is a medical procedure used to treat spider veins, reticular veins and varicose veins. This treatment can only be performed by a medical Doctor. What types of leg veins are there? 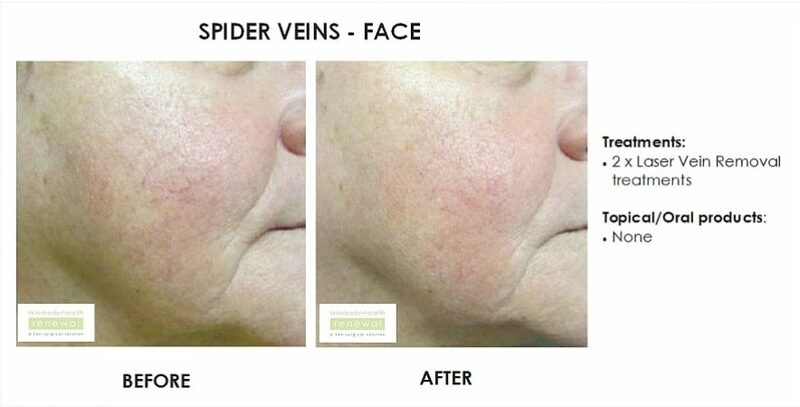 Spider veins - red or purple fine veins. Reticular veins - blue mid sized veins often feeding into the spider veins. Varicose veins - large blue ropey veins often traversing the leg. All these veins can contribute to unsightly and cosmetically dissatisfying appearance of the legs, as well as medical complications such as aching, swelling, appearance of bruising, ulceration, eczema and pigmentation. Hereditary - one with a family history of leg veins inherit a genetic tendency for the venous system to have increased pressure over time. Pregnancy - related to both the increased venous backflow as the uterus grows and pushes on the venous system, as well as the increased blood volume in pregnancy. Prolonged standing - at rest with our legs up, we have no pressure in the venous system. On standing the pressure increases dramatically to 100mmHg. Walking gets the calf muscle pumping and drops the pressure to 30-40mmHg. With prolonged standing, the high pressures override the valves assisting in the return of blood, the valves then break down and blood pools in the leg veins. Contrary to popular belief, crossing your legs has no effect on developing leg veins. What is the mechanism by which veins develop? Blood in leg veins normally travels upwards to the heart. Due to gravity blood tries to flow back down towards the feet. However, normal veins have valves, which close to prevent abnormal flow towards the feet. It is the breakdown of these valves that leads to abnormal flow, which in turn leads to increased pressure in the veins. The increased pressure eventually causes the vein wall to expand and bulge, producing a varicose vein. Varicose veins serve no useful function to the body's circulation. Our body has the ability to establish alternative pathways to bypass the abnormal varicose veins. When varicose veins are closed down, the circulatory system improves, as do many of the symptoms. It is important to understand that varicose veins can be a progressive condition and that totally new veins can develop with time. Maintenance treatment is likely for most patients. 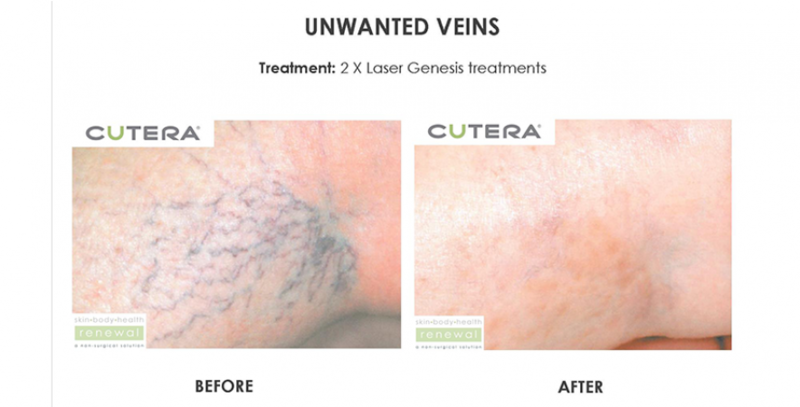 Can you prevent unsightly veins? Due to the causes, there is very little that can be done to halt the development of leg veins. Wearing compression stockings / support hose only delays their progression. Maintaining a healthy weight can also reduce backward pressure on leg veins. There is a treatment available for these types of veins that do not require surgery or significant interference in one's lifestyle. The procedure is called Sclerotherapy. 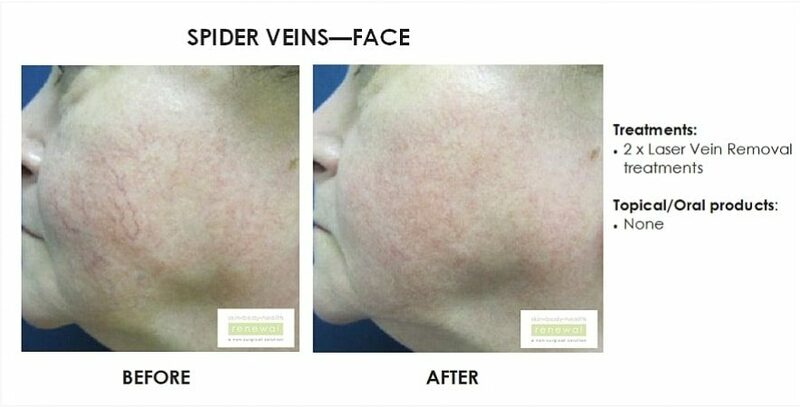 A liquid solution called a sclerosing agent is injected directly into the veins, causing irritation and inflammation. This makes the vein stick together and scar thus preventing blood flow in the vein. This process takes 6-8 weeks to complete. The procedure involves a series of tiny microinjections into the veins of each leg under direct vision. You may feel a slight stinging or throbbing sensation that is brief and relieved with walking after the procedure. Sclerotherapy is best for any areas in the lower leg region. Red lumps like mosquito bites over the injected areas. These tend to last 6-24 hours. Some discomfort eased with walking and occasionally requiring simple analgesic medication. Rarely patients have reported generalised muscle aches immediately after the procedure, but this is very transient. It is very rare and an uncommon situation that an allergic reaction may occur. Bruising that can last 2-3 weeks, Arnica cream applied lightly to the treated area may help with bruising. Blood trapping, whereby blood gets caught when the vein closes down forming a brown tender lump along the vein. It can be cleared by putting a needle in the vein and squeezing the old blood out. Matting, related to opening of smaller spider vein channels. These can be closed with fine injections at 6-8 weeks if this has not occurred already. Brown pigmentation due to haemosiderin (iron) deposit from the leaky vein. This can take 3-6 months to fade but can be treated with laser if not resolved in 12 months. DVT (Deep Vein Thrombosis), clot in the deep venous system seen in 1/7000 people. Ulceration seen in 1/200 people usually elderly, heavy smokers, diabetics and injections along the shin area. These heal with dressings and may lead to scarring. What are the possible consequences if I DO NOT have this treatment? Symptoms commonly associated with varicose veins include leg tiredness, heaviness, aching, throbbing, restlessness, tingling, itching, numbness and swelling. Complications such as phlebitis, blood clots, dermatitis and ulcers can occur if veins are left untreated. What can you do after treatment? Following treatment, which takes 30-45 minutes per leg, you are free to carry on normal activities just wearing a compression stocking. Exercise is encouraged at least 30 minutes per day - any form that gets the calf muscle working. No strenuous exercise or gym must be done for 2 weeks after the procedure. Sclerotherapy by injection is a very effective method of treatment. You can expect 50-80% improvement with a single treatment and improved success after a course of between 2-5 treatments. The recurrence rate of dilated veins can be up to 30% over time. This can be improved with avoiding stiletto high heels and prolonged standing, maintaining adequate body weight and regular exercise. This will depend on the extent of the leg veins. There may be an associated Medical aid rebate for some veins which must be claimed by the patient. What preparation of the skin is needed prior to the Sclerotherapy procedure? On the day of treatment; the patients legs should not be shaved because a burning sensation may result when cleansing the area prior to treatment and also to avoid bleeding during treatment caused by razor nicks. Moisturizers should not be applied on the day of treatment as this may cause unnecessary slipperiness of the skin. Substances such as Omega 3, paracetemols, Evening Primrose oil and St Johns Wart should be stopped 1 week before the treatment. You will receive pre- & post-care instructions when making your appointment. What results can be expected after Sclerotherapy? Realistic treatment results can be noted a while after treatment and are not immediate. Legs and veins will often look worse before they look better. Expect a gradual lightening of telangiectasia rather than complete resolution after the first treatment. You may notice bruising and redness in the areas at the injection sites. The bruises will diminish within two weeks. In many cases, there may be some residual brownish pigmentation which may take up to a year to completely fade. Can all Skin types be safely treated with Sclerotherapy? Yes, Sclerotherapy can be performed on all Skin Types. Review -"Visible results after the first treatment!" For years prior to starting the treatment with the Body Renewal Doctor, I was frustrated with ineffective methods; for the first time I have found something that really works. The results are exceptionally good and already visible after the first treatment. She knows what she is doing and is highly recommended. Review -"Happy with my legs"
I suffered with the appearance of various veins for years and I never thought it would ever disappear and God knows I made my peace with these veins. I was introduced to a doctor at Skin Renewal and she did a few sessions of Sclerotherapy on my legs and later she introduced me to Carboxytherapy. Not only do I look good, but my health has improved and by that I mean no more ankle sores and bye bye veins. May God bless the doctor for having such a steady hand and once again thank you to the Skin Renewal team. I would like to thank the Skin Renewal team for restoring my confidence and also improving my health. I suffered with the appearance of various veins for years and I never thought it would ever disappear and God knows I made my peace with these veins. I was introduced to a doctor at Skin Renewal and she did a few sessions of Sclerotherapy on my legs and later she introduced me to Carboxytherapy. Not only do I look good, but my health has improved and by that I mean no more ankle sores and bye bye veins. May God bless the doctor for having such a steady hand and once again thank you to the Skin Renewal team. Painful, but the Doctor is very professional. The treatment is expensive, but hopefully worth it. I feel well looked after at Bedfordview. skleroterapie behandeling was regtig n goeie ervaring. Hulle was tegemoedkomend omdat ons ver bly. Die behandeling is goed hanteer, met vooraf verduideliking, en die vrae word ook profesioneel beantwoord. Ek sal dit aanbeveel vir die wat dit nodig het. Die ondervinding me skleroterapie behandeling was regtig n goeie ervaring. Hulle was tegemoedkomend omdat ons ver bly. Die behandeling is goed hanteer, met vooraf verduideliking, en die vrae word ook profesioneel beantwoord.